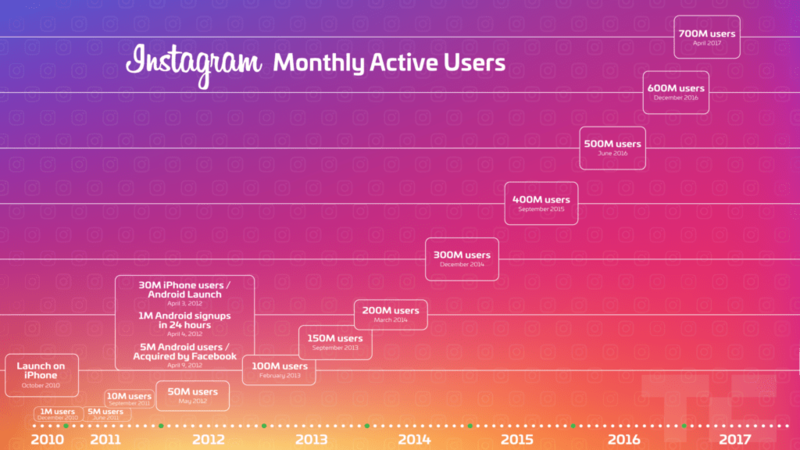 Instagram is the most actively growing social network in the past two years. It is a photo sharing app that took over the social networking world by storm, when it was launched in October 2010 and is still growing. Check out these facts to fully understand the phenomenon that Instagram is. Whether you should be on Instagram or not is an irrelevant question. The real question here will be how do you make the most of it? I am offering tips on using Instagram for Business and personal brand promotion. The most important thing on all social media activities is consistency. Be consistent, however, don’t post more than 4-5 times a day, otherwise, the followers will end up with brand fatigue. Pick out your best images and consistently pepper them over the day. Aim to post at-least one image per day and maximum 2-3 images in the day. Use automation tools like Buffer and Tailwind to schedule and Instagram without a glitch. A quick search on Instagram will throw up two sets of people, one with amazing pictures and the other with too many random images. Instagram is a visual medium and the visitor sees and enjoys the image first. Create powerful images to mesmerize him. Identify your niche. Just because you sell everything under the sun, your insta feed need not put all the photos. Study your audience and decide why do you wish to use Instagram. If it attracts people interested in fashion, focus only on that. Tie your latest trends with relevant up selling, So you can showcase clothes, shoes, hats, scarfs and even handbags but avoid gardening equipment without a theme. With a feed full of images, it is easy for a viewer to miss the double tap. Having great pictures and uploading them on Instagram is not enough. Ask what you want the viewer to do! Build engagement by asking them to like, comment or tag their friends. Do reply and like their comments and follow insta-etiquettes. As Hashtags are a big part of Instagram and around 30 hashtags on each post are allowed, the image descriptions can get really busy. At times an important message might get lost in the sea of hashtags. It also looks a bit jarring. To avoid this, you can keep your description clean with just writing what the image describes and add the hashtags as a comment on the image. Every social network has its own uniqueness which helps audience discover the brand. For Instagram it’s hashtags. On an average having around 30 hashtags per photo is considered a good number. Discover good hashtags that are relevant to your brand or image and use them with every image that you post. Add searchable tags and location to your Insta stories too to be listed and be found. Have a good repository of hashtags as copy-pasting the same hashtags for each image is not encouraged by Instagram and you might get penalized if your image is not relevant to the hashtag. Instagram has inbuilt filters and you can use them with every image. It has been observed that images with filters perform better than images without them. A recent survey found that filters with higher contrasts, warm temperatures, and higher exposures are supposed to get the most likes and engagement. Using cross-posting tools will help you streamline your posting process and communicate a similar message across platforms. Cross-promote your social channels. Add an Instagram feed tab to your Facebook page, Post on various channels asking your audience to follow you on other channels. Collaborate with bloggers and brands in your niche and help promote each other. Nice, didn’t know about posting hashtags in comments. Informative. I am not regular when it comes to Instagram. But it is addictive. Hey Neha this is all what I actually needed at the moment. With Instgram taking over all other social platforms I am also learning every bit of it. Excellent tips.I have heard a lot about Instagram #.They are the golden snitches.Thanks for sharing. Fantastic tips Neha and I am going to modulate my insta feed on these lines from now on!! These are some truly helpful tips you’ve shared, Neha. While I do agree that some filters are more popular than the others, I had no idea about hashtags in comments. Thanks for writing this very helpful post. A nice informative post, Neha. Didn’t knew about comment hashtags. WIll try them soon. Instagram is one of my favorite platforms. Always exploring and experimenting more. 🙂 Good piece. good tips… i can see many pointers here which i need to incorporate into my own insta accounts too. Thanks for sharing. Very informative post. Though I’m well versed with Facebook and Twitter for personal and professional use, Instagram is a channel I’m yet to leverage. Didn’t know we are allowed up to 30 hashtags. Thanks for sharing the tips here. Good luck to you Neha on your wonderful blogging journey. This is interesting. I had no clue that even filters could help your post perform better. This is great series you’re doing Neha. These are some great tips Neha. I didn’t know about comments hashtags and also didn’t know about the pics with filters. Thanks for sharing. Nice and beautiful insights here. I am sure many will benefit from this post. Thanks for sharing it. Cheer!! Quite informative. I really gained some important information from this. Thanks, Shamik, glad you found it useful. Good points. Will try to be more consistent now.